Whether acquiring a hospital bed for an individual at home or for a healthcare institution there are a number of options which need to be considered prior to making final decisions. 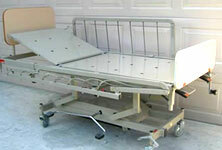 First and foremost, it needs to be considered whether a hospital bed will be purchased or whether it is to be rented. If the bed is to be purchased, should a new bed or a second hand bed be chosen? All three of the aforementioned options have their own distinct set of advantages and disadvantages but second hand hospital beds can often offer the most attractive solution. The two options that are most widely publicised when it comes to hospital beds are renting the bed or purchasing it new. Both options have definite disadvantages to a person that is chronically ill over a long period. Renting the bed would mean that the individual is periodically paying out a fixed sum which may be economical in the short term but can very quickly overtake the cost of purchasing the bed. Such costs result in paying out ‘dead’ money with no tangible return. At the end of the lease the bed is simply returned to the rental company, leaving the individual without an asset to sell in order to regain some of the investment. Similarly, purchasing a new bed has a very definite disadvantage in that the outlay to purchase such a bed is considerable. Producing such a large amount of money in order to pay for a hospital bed may simply not to viable for an individual. In both instances second hand hospital beds provide an extremely attractive third option which eliminates the disadvantages of the two aforementioned options. By definition second hand hospital beds are much cheaper to acquire than new hospital beds due to the fact that they have had a previous owner and their value has depreciated. Furthermore, by purchasing a bed rather than renting it the individual has a tangible asset which can be sold when it is no longer necessary. This means that the individual can reclaim some of the initial investment and the amount of money lost to depreciation and passing on to a new owner will generally be much less than the cost of rental, substantially reducing the ‘dead’ money involved. The current economic climate is leading to serious financial constraints upon all public institutions but especially upon the healthcare sector. The result is a reduction in budget for healthcare institutions which means new and innovative solutions must be found in order to reduce the financial burden. One such way is by acquiring second hand hospital beds and other medical equipment rather than purchasing them new or renting them. Buying second hand hospital beds offers substantial financial benefits over the other two options, offering an opportunity between buying new and renting which is often neglected. For healthcare institutions, buying second hand hospital beds greatly reduces the initial outlay and removes the need for costly and burdensome periodic payments.